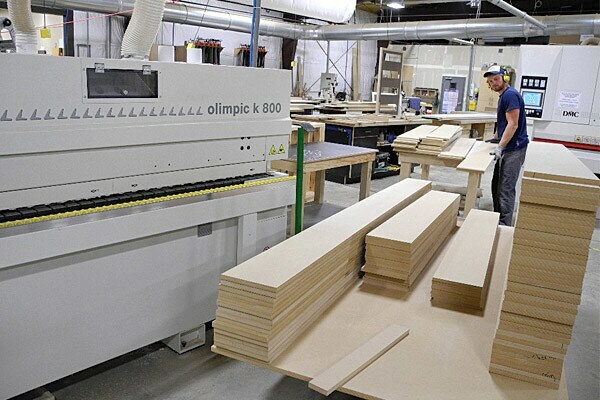 Earth Elements has created a great design center for material and finish options along with a new modern cabinet shop to deliver cabinets, millwork and interiors to a wide-ranging clientele. The company is located in Southwest Montana near Bozeman, Montana. It is also 30 miles from Big Sky ski resort and the Yellowstone Club, an exclusive private ski and golf community. The cabinetry shop fabricates mostly residential custom cabinets, with some special commercial applications. They also make interior and exterior doors, as well as furniture. Mike Wolfe, cabinet shop manager, said that each job is different. “We’re often focused on cabinets and doors. Cabinets are heart of it.” Earth Elements offers work ranging from the economical to the extravagant. “We are here to help our customers achieve the aesthetic they desire, no matter the budget” Wolfe said. “We have an extensive design process” - Wolfe said. “We can design cabinets from the ground up, or take projects where a lot of that upfront work has been done by an architect.” Cabinet design is done in AutoCAD, and Cabinet Vision is used to get information to the shop floor in a format that can be used by the people there, and that ensures consistency. Earth Elements is capable of producing cabinets in any style. The company does a lot of veneer, some solid wood, DF core, and lightweight composite cores. They are seeing a lot of grain matching and frameless cabinetry. Veneer may be used on MDF doors or composite core doors, which provide a stable core and weight savings for a high and wide door size. The Earth Elements design center in Gallatin Gateway is a standout. Showcasing cabinetry, wood flooring, door hardware, natural stone and quartz slabs, tile, fixtures and appliances, all covered in natural light from floor-to-ceiling windows. The showroom itself has many wood samples to show customers that they can touch and feel, and is more in line with the contemporary, modern aesthetics of new plumbing, hardware, flooring, and bath fixtures. (The company has a separate stone fabrication shop). “Our design center customers are able to look at wood samples next to tile and stone samples, all under one roof,” Wolfe said. “That’s really unique. Homeowners, architects and interior designers have the ability to come to one place. It’s beneficial for the client to see everything at once. We do that really well.” “We’re unique in that we carry a lot of products no one else does. We try to present options: Door and finish samples, the whole standard scheme of a showroom. But we don’t want to limit ourselves to that.” The showroom is attracting business from returning clients, architects, builders, and designers to walk-in business. “We want to demonstrate the company’s capabilities but also present different material and hardware options,” Wolfe said. The Earth Elements shop moved to its Gallatin Gateway location in 2014, and has been up and running for more than a year. Sixteen people work in shop on cabinet side, with 60 employees overall at the company. Shop space is 16,000 square feet, including the design center the building is 36,000 square feet. A Morbidelli Author M800, Olimpic k800 edgebander, and DMC Eurosand L widebelt sander are some of the most relied upon machines in the shop. The Morbidelli was purchased for its large-scale capabilities. The table is 16 x 6 feet, so they can service large live-edge slabs. The five-axis router has many capabilities, and is used in many applications. “Most five axis routing is positional five-axis routing,” Wolfe said. “We’re machining the edge of the board. We’re doing operations in that five-axis position, versus true five-axis routing where you’re changing three axes at once. 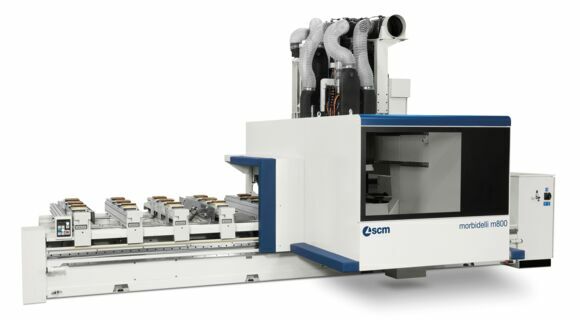 We have that capability and can machine three-dimensional parts, but from our end, at this point it’s being primarily used for five-axis positional routing.” Wolfe dealt with the question of whether to have a pod-and-rail or nested-based router by having both. He designed a modification so that the Morbidelli can fulfill both roles. Wolfe, who has 12 years of experience in cabinets and furniture, said he is excited about the growth of Earth Elements. “Being a new business, there are a lot of relationships that are being developed.” He is looking forward to see where they go from here.